Marmita translates as 'pot' or 'casserole' in Basque, while the suffix ko is the genitive case, so that marmitako literally means 'from the pot'. Of course, just about everything in Basque cooking comes 'from the pot', but only this venerable dish goes by that name. 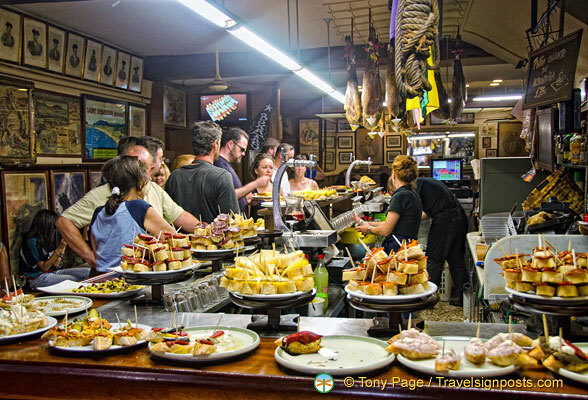 Originally it was cooked on board fishing boats - and still is - but for decades now it has appeared on restaurant menus in the Basque Country, sometimes even prepared with salmon. The stew is soupy but thick, specially when the potatoes are 'cracked open' to yield more starch. 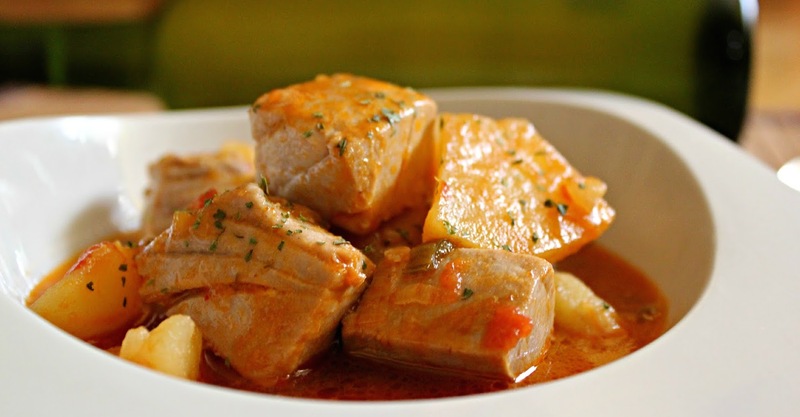 You can prepare marmitako up to the point a which the tuna is added, and then reheat the stew up to a day later and add the tuna. In a heatproof bowl, combine the dried chiles with boiling water to cover and let stand for 30 minutes, or until soft. Drain the chiles, slit them open, and scrape off the flesh with the edge of a knife, discarding the seeds, skins, and stems, Set the flesh aside. Cut the tuna into small pieces. Sprinkle the pieces with coarse salt and set aside. Peel the potatoes. To 'crack' the potatoes into chestnut-sized pieces, make a small cut in each potato and then break it open the rest of the way. Set the potato pieces aside. In a stockpot, heat the olive oil over medium-high heat. Add the onion, garlic, and bell pepper, and the flesh from the chiles, stir well, and cook, stirring occasionally, for 5 minutes, or until the onion and bell pepper have begun to soften and all the ingredients are well blended. Add the potatoes and pimentón and mix well. Season with a little coarse salt and add water to cover by 2 inches. Bring to a boil, cover, decrease the heat to medium-low, and cook for about 30 minutes, or until the potatoes are fork-tender. Add the tuna pieces to the pot and simmer for 5 minutes, or until the tuna is opaque. Remove from the heat and let stand for 30 minutes before serving. If the soup is very clear because the potatoes didn't release enough starch, mash a piece or two against the side of the pot with the back of a spoon and shake the pot a little. Reheat gently to serving temperature (if your pot retains heat well, the stew may still be piping hot and you won't need to reheat it). Ladle into warmed bowls and serve at once.